The topic being studied at the moment is Other Living Things. Although some themes in art are not exotic, this doesn't mean they don't have the power to inspire. Objects that can inspire an artistic 'explosion' can include pets, animals, fruits, flowers, birds, insects, fish and imaginary beings. The art work being critiqued in this essay is 'A Lion Attacking a Horse' by George Stubbs. It was created using oil pants on canvas, in 1765. Created in a naturalism style, the artwork shows a lion attacking a horse on a mountainous landscape. The horse has a distressed expression on it's face, while it's body is tensed up in pain, showing a detailed structure on the horses body. This is what naturalism is: a convincing representation of the real world but it's not precisely realism. It is easily seen that the theme is war and possibly based on a narrative of what happens in nature everyday. War is preferred because the lion is 'devouring' the horse, even though this is part of nature; that's what a lion has to do to live but for the horse, it wants to live. The lion is the enemy while the horse is the ally or prey. Stubbs has chosen to place the main subject in the center foreground along with the other objects in the background and painted around the edges, such as trees and bushes. There are clouds in the sky, unlike a sun which would create some kind of happiness within the artwork, but this is not what George Stubbs was aiming for. Along the ground, there is grass too. With all of these things in mind, it creates a bushy scene. WriteWork contributors. 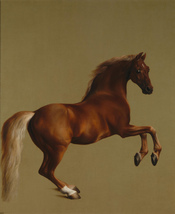 "Critique on 'A Lion Attacking a Horse' by George Stubbs By Emily Bridget" WriteWork.com. WriteWork.com, 20 March, 2009. Web. 18 Apr. 2019.